On Jan. 22-23, instructors and directors of the voting membership of Drum Corps International will meet in Indianapolis to discuss eight new rule proposals as part of the annual DCI winter business meetings. DCI.org columnist Michael Boo breaks down each of the items that will be considered and gives his insight and opinions on how passage of each rule might affect the direction of the drum corps activity. The DCI rules change process is an annual affair that kicks off each summer when proposal forms are distributed to the corps and judges. Once any submitted proposals are received by the Rules Change Committee in the fall, they are sent out to judges, directors and instructional staff members for review. Conference calls are convened in mid-November where instructors—representing the individual captions of their specific corps—discuss the proposals, ask questions, offer their opinions and finally take a poll to guage whether or not they think the proposal should be passed. The Judges Advisory Committee also has their own conference call to discuss and share their thoughts. At the annual winter DCI business meetings (Jan. 22-23, 2010 in Indianapolis) instructors meet in person in caucus sessions to further discuss the proposals. Staff members from each eligible corps (World Class member corps and the previous season's Open Class finalists) are polled for a recommendation on whether or not the proposal should be passed along to the full membership to debate, discuss and eventually vote on in the final round of the rules change process. Each of the proposals that are passed in the membership meeting will become part of the DCI rule book, depending on implementation dates that are agreed upon by the voting members. Eight proposals have been submitted for 2010. Part I of this series will look at two proposals to change the age limit for member eligibility and placement of corps' sound engineers during competitions. Part II will look at two proposals that involve the period of time between when a corps first enters the field and when judging commences. Part III will address four proposals regarding changes in how corps are judged. George Hopkins of the Cadets submitted five of the eight proposals currently on the table for 2010. Over the years, Hopkins has been a one-person think tank of new ideas and possibilities; and quite frankly, without his input, we often wouldn't have much of anything at all to discuss when the rules process comes around. This first proposal comes from Hopkins, and is almost identical to an extended age-limit proposal he submitted back in 2008. Age Requirements (for 2011 implementation). 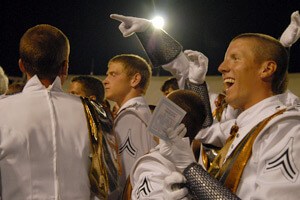 Phantom Regiment 'age-outs' celebrate in 2008. Currently, corps members may march in a DCI corps provided they don't turn 22-years of age prior to June 1 of the calendar year. Under this proposal, they would be allowed to march provided they don't turn 23 prior to January 1 of the year in question. Putting it in simpler terms, any member who doesn't turn 23 during the calendar year may march that season, allowing all 22-year-olds to march instead of just those who turned 22 on or after June 1. This effectively adds five months of eligibility to the membership pool. Hopkins points out that some corps members today are coming to drum corps after college, and others are taking off a year or more of their higher education to march before returning to college. He believes that an additional year of corps "can only be of assistance in the development of many young men and women." As for the financial impact on corps, he points out, "If anything, we might say that the investment we make in folks can be rewarded with additional participation time." It should be noted that if this does pass as written, it will not provide members with that extra year of eligibility this season, as it won't be implemented until 2011. It has been argued that the top tier corps are squeezing out younger members every time the age limit is extended, and that in doing so, DCI becomes less of a "youth" activity. But, it also may be pointed out that with 150 members—as opposed to a maximum 128 just a few years ago—more members of all ages are now eligible to march in any particular corps. While some members feel a more restrictive age limit allows them to move on with life, there would certainly be others who would be ecstatic if this rule passes and provides them with an extra year to join the elite ranks of Marching Music's Major League. Considering Hopkins' 2008 age-limit proposal was voted down in the instructor caucus session and was consequently not sent along to be voted on by the board of directors, it will be interesting to see this week if two-year's time has changed anyone's mind on this subject. Sound Engineer in Press Box. 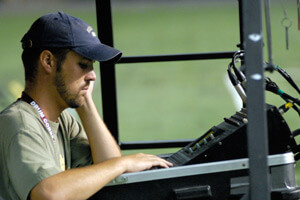 A staff member monitors the mixing board from the field. Phantom Regiment's Dan Farrell has offered a proposal for corps to place one sound engineer in the press box during their respective performances. This is in addition to the staff sound person who is currently on the field during the performance of their groups. The staff member in the press box would be allowed to communicate via wireless device with the staff sound person on the field, in order to ensure a quality sound between the amplified front ensemble and the field ensemble. This will, according to the proposal, "allow for designers to take more chances and create better results, knowing that they will have the ability to blend the overall sound of the ensemble." The press box location of this sound engineer could lead to a better sounding product without placing an instructor in the audience, someone who may distract the audience by communicating with the staff member on the field. This could present a logistical problem in smaller press boxes by creating the need for space for one more person in an already crowded press box, a point Farrell admits. He also suggests that this person would have to be in a separate location from the judges, which could further be a problem in some smaller stadiums. Beyond the logistical concerns to work out, this proposal has so many things going for it, it's kind of surprising it hasn't come up before now. Fans have often commented how the amplified front ensemble of some corps often blows away the horns on the field. This is often due to the fact that different stadiums present different acoustical challenges. Performing in open-air stadiums most of the season and then going indoors in San Antonio, Atlanta and Indianapolis, creates a new set of performance challenges that may not be fully anticipated during previous shows. With someone sitting in the press box, (or in some cases, perhaps on top of the press box), each corps can benefit from the knowledge that the blend of amplified instruments to the rest of the corps will be as close to what is desired as is humanly possible. Currently, the single sound engineer on the field doesn't necessarily experience what the audience (and judges) are acoustically hearing. I would be very surprised if this proposal didn't pass since there is always an interest from all sides in creating the best blend of sound possible for the final product. Coming tomorrow: Part II of the 2010 Rules Change series looks at what changes might be in store for the time period each corps is given to setup before a performance and what they can do within that "pre-show" period.